The Trump administration wants to ease an Obama-era rule that required coal plants to use expensive technology to control carbon emissions. 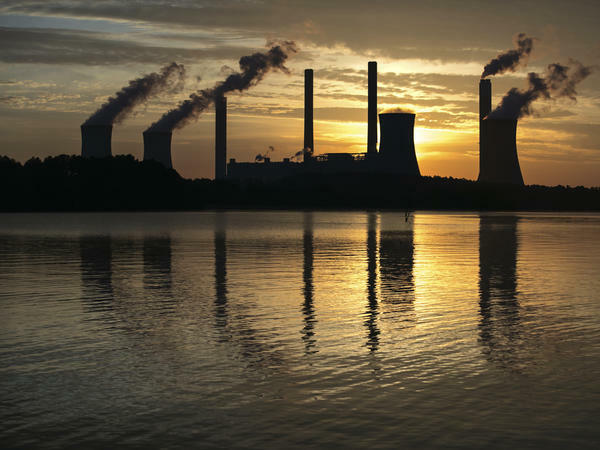 The Trump administration plans to eliminate an Obama-era requirement that new coal-fired power plants have expensive technology to capture carbon dioxide emissions. This latest administration effort to boost fossil fuel industries comes as leaders from nearly 200 countries are meeting in Poland to discuss how to keep greenhouse gasses out of the atmosphere. And amid reports that CO2 emissions are rising again, as well as the administration's own report that climate change is causing more severe weather more frequently and could eventually hurt the U.S. economy. The Environmental Protection Agency proposal would revise its "New Source Performance Standards" for coal power plants, allowing coal-fired generators to emit more CO2 per megawatt-hour of electricity generated. This would ease an Obama-era rule that was a central target in critics' accusations of a "war on coal." The coal industry argues the existing Obama administration requirements made it all but impossible to build new coal power plants, by requiring costly technologies such as carbon capture and storage. EPA Acting Administrator Andrew Wheeler, a former coal industry lobbyist, echoed that argument in announcing the proposed rule change. "By replacing onerous regulations with high, yet achievable, standards, we can continue America's historic energy production, keep energy prices affordable, and encourage new investments in cutting-edge technology that can then be exported around the world," said Wheeler. Environmental groups argue that in order to reduce climate change risks, the world will have to stop burning coal. They blasted the EPA's announcement. "This is just one more foolhardy move by a misguided administration that will be judged harshly by future generations," said David Doniger, senior strategic director of the Climate & Clean Energy program at the Natural Resources Defense Council. "Today's proposal is nothing more than another thoughtless attempt by the Trump Administration to prop up their backwards and false narrative about reviving coal at the expense of science, public safety, and reality," said Mary Anne Hitt, senior director of Sierra Club's Beyond Coal campaign. In fact, it's not at all clear if the change would help the ailing coal industry. In recent years it has stopped building new plants and been shutting down old ones instead. The federal Energy Information Administration reports U.S. coal consumption has declined over the last decade and this year is expected to be at its lowest level in 39 years. Even as coal use rises in China and India, coal has struggled in the U.S. to compete with cheaper electricity produced from natural gas and renewable energy. "It does appear that this proposal would make it feasible for new coal plants to be a viable option in the future in the United States," says Michelle Bloodworth, president and CEO of the American Coalition for Clean Coal Electricity. This is the latest in a series of efforts the Trump administration has taken to help the coal business. Previous actions include relaxing Obama-era regulations on carbon emissions and mercury emissions as well as rolling back existing regulations that govern coal ash. The EPA will collect public comments on the proposal for 60 days and plans to hold a public hearing on the proposed rule change.